At 6:30am the skies were cloudy and the view outside my window was gloomy at best, another 45 minutes would pass before I got the courage to get ready and roll. I'm doing this ride as if it was a brevet, I need to see how long it takes me to do the whole route as there is a 13.5 hour limit for completing a 200k brevet. That means I'll be doing few and short stops. However I will need to stop more than usual to check the distances on my cue sheet against the reading of the bike computer and take notes. I'm very familiar with the route, I came up with the idea, the cue sheet and have ridden all segments before; however this is the first time I ride the whole thing at once. The night before I installed a second bike computer on the Habanero just to make sure I have a backup in case my primary computer dies in the middle of the ride like what happened a month back when I was confirming distances on parts of this same route I'm attempting today. The extra computer is one of those old Cateye CC-AT-100 that supposedly can measure altitude. I is my wife's computer and I hate it, it has some of the least intuitive controls I've ever seen on a bike computer, just like all other Cateye computers I've seen before. Cateye makes some reliable bicycle electronics but usability of their bike computers is where they sin. 8:10 and I am at the Golden Gate Bridge reseting both computers pushing the left leg over the left crank. A very cloudy and soon foggy morning. Soon I get into regular pace, not to fast not to slow. The headlands come and pass under my tires and then I start climbing Deer Park the lovely trail that goes up forever, a canopy of trees lines the trail most of the way. Up to this point on the ride I've seen fresh bike tracks on the route, I think those are Greg's tracks. I know he is riding part of this route today but probably he left much earlier than I did and will not see him. 10:41 Made it to the Pantoll ranger station where a group of road cyclist is getting ready to leave. On rides like today I carry my backpack with a 100oz reservoir and also bring an empty water bottle to ease the refiling process (and to carry extra watter if/when needed) The night before I picked the water bottle and lid from the dishwasher and apparently did not screw the top enough, now I have a watter bottle without a lid, oh well. Fill up and move on. The fog is finally clearing and I can take the nice views Mt Tam has to offer. I'm lucky I get to ride here whenever I feel like. I start thinking where is going to be lunch, at Lake Lagunitas, Alpine Damm, Bolinas Ridge, Olema, SMP park, Fairfax? Can't male up may mind and decide it will be whenever I am hungry and there is a descent place to sit down. At the water fountain before Shaver grade I fill up the water bladder again. 12:00 I get to Fairfax-Bolinas road and start moving west towards Alpine Damm. Not many riders on the road today, at least not going in the direction I am going. I finally make it to the Damm and after a quick stop for a cliff bar I am on my way up to the Bolinas Ridge trail head up there where both paved roads, Fairfax-Bolinas and West Ridgecrest Blvd intersect . Slow progress after all that off road climbing earlier but I get to the top in decent shape. Weather up here is completely different from the weather on the trails of Mt Tam. 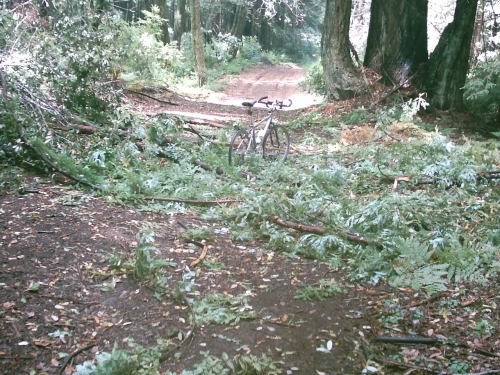 Here the ground at the trail head is wet and the redwoods keep dropping big watter drops onto me. There are sections where traction is a little tricky with the (minimum) thread of my tires but I dig into my bag of tricks and am able to overcome obstacles and stay upright. 1:48 Randall Trail, from here is all a nice 1.5 miles straight down to Hwy 1. This is another of the great sections if this ride. Good ground surface, enough turns and obstacles to keep me concentrated and the promise of smooth riding once I get to the pavement down there somewhere make riding easy again. 1:56 At the foot of Randall Trail I am dispensing information to two separate cars filled with tourist driving Hwy 1. Olema is just a couple of miles down the road. I don't feel like stopping there and continue to Samuel P Taylor park. The north end of the bike path inside the park was recently paved and makes moving along easy. Another water stop this one inside the park. Maybe lunch can wait. 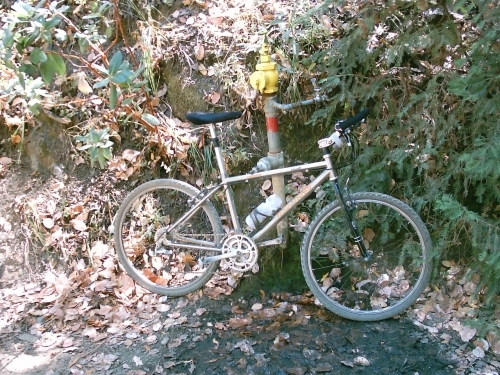 3:07 The Inkwells Bridge @ Sir Francis Drake (SFD) I rejoin SFD and ride the boring miles to Fairfax. Once back at civilization I want to get coffee at my usual stop but since I am doing this ride as if it was a brevet, there is no time for luxuries today, bye, buy Java Hut... These urban miles seem harder today, the abbreviated paradise loop and then Mill Valley roads are getting harder and harder, I need to eat soon. 4:55 I have to take a quick lunch break at the Old Railroad Grade trail head. Not the ideal spot but it will do. The small carnitas burrito I been carrying all day brings some life back to what is left of me. I am exhausted. Climbing to the West point In hostel is a grind. At the water fountain next to the trail I replenish my water supply, make a call to the wife and have an energy gel. The combination of all those seem to give me a second air, at least for a while. 6:10 I'm happy to get to the West Point Inn! 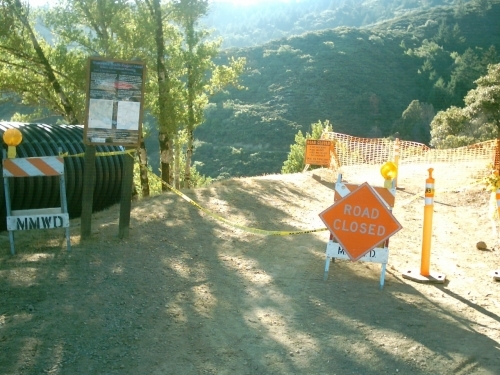 Unfortunately the joy last just for a couple of seconds when I discover the Old Stage Road trail is still closed. Last time I was here I read the sign that advised it would reopen August 17, so much for completing my La Ruta Loca today, I'm disappointed. Down the way I came up I go and soon I'm riding the Mill Valley bike path to Sausalito. 7:24 Back at the place where I started 11:14 hours ago, The Golden Gate Visitor Center on the South end of the bridge. 107.09 Miles (172 kms) of mixed terrain joy. Once Again the mountain had a different idea about me riding a long Mixed terrain ride on its roads. But I will be back either on the same or a slightly modified route to make my crazy idea of a 200k San Francisco Mixed Terrain route a reality. La Ruta Loca will be. The crappy Cateye computer/altimeter combo seems to have registered 12180 feet of climbing on two wheels, most of it off-road. However for some reason I doubt those numbers. I need to borrow a decent modern GPS toy to get a more accurate reading. Had I completed the route as I had it on paper, my guess is, the total altitude gain would have been about 1500-2000 ft. more. Also If Old Stage road had been open my guesstimate is I would have taken me another 2:30 hrs to finish the route for a total of 12:44 hrs just with under an hour to spare. But if I take most of the note taking stops I had to to today that would buy me 15-20 minutes? Still a close finish to the 13:30 hrs time limit. For the past three years I have "placed" very much in the middle of the San Francisco Randonneurs pack, near the average time for the events I have participated. If a Mixed Terrain 200k based on my route ever flies, it would be a demanding event for most riders, it was a very demanding route for me today and according to my estimates I would finish near the closing time of the last control. I know the route and can navigate it without a cue sheet, I designed it, but others will not have the benefit of being familiar with the route so things would be very interesting to say the least. I my opinion the route I originally set to ride, is comparable to riding a "regular" (read paved) 300k but this one I think demands a little more because of the skills necessary for riding some of the off road sections and the amount of navigation involved, 5 pages of about 25 instructions each! There is no date set yet. I'll have more info after this Labor Day weekend. Great to hear you are interested in doing it. Me and Phil have the idea to pirate willy's ride on 9/22 to be ready for the ruta (or rutita) 9/29. You are right about the advanced notice Greg.I am thinking a weekend in September, the 15th or the 22nd? It will not be an officially sanctioned brevet but more an invitation to riders to do a ride under "brevet rules". That may attract some riders but discourage others. I guess you passed later than I did then? It was a little chilly up in Bolinas Ridge but down at Hwy 1 was nice and a little warm. Nice write-up, Carlos. 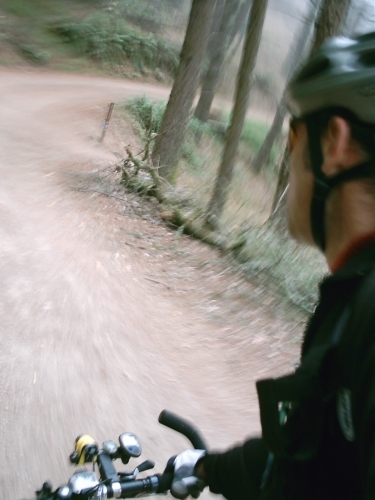 I remember those branches in the photo above; that was shortly before I took a spill. So when are you thinking about doing the first official ride for this route? I think the further in advance you set a date, the more likely we can get some additional riders to do it. Unfortunately, we're battling the calendar already. It'd probably be best to do this within the next month, while there's still as much light as possible and while it's still not too wet. When I went through parts of the Bolinas Ridge Trail on Saturday, it wasn't just the occasional drop falling; it was flat out raining! I should have eaten something other than cliff bars earlier but had my mind set on moving, a mistake I will not repeat next time. This is a demanding route with very little room for logistic mistakes like that. Wow, that sounded like a HUGE and EPIC ride. You didn't eat lunch 'til nearly 5pm? I agree that if this route takes you as long as it did to finish, it would be VERY challenging for most people. Maybe shift the mix to a little more road and a little less off-pavement miles? I dunno.